Make fresh fruits and vegetables last longer! 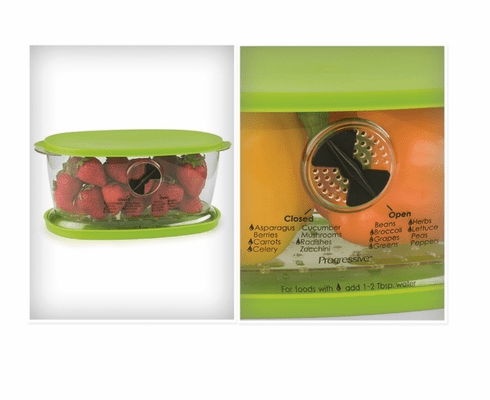 With the Progressive Fresh Fruit and Veggie Keeper you can extend the life and freshness of fruits and vegetables. The smaller size produce saver fits perfectly in the refrigerator on the shelf or door yet still holds bunches of carrots, radishes, grapes, green beans or cherries. Wash and store in one container. Remove the bottom lid and the fruit and veggie keeper doubles as a colander. 1.9 quart (7.5 cups) capacity. Adjustable vent regulates air circulation while water reservoir provides needed moisture. Produce storage guide printed on front of Fresh Fruit and Veggie Keeper for quick and easy reference.